Here's another couple of abandoned wagons at Sutton Park. They were dumped in the former siding after developing a hot axle box. The siding has since been removed leaving the wagons on an isolated piece of track. A close-up of the stranded beasts at last, now finding use as flower-beds. Well done that man ! There was once an article in magazines titled lost wagons. That would fit the bill! 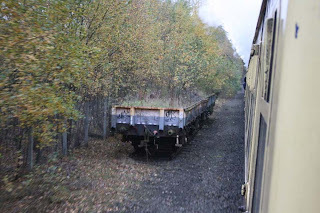 Whilst on tour with 37248 heading towards Manchester on the return we passed a rake of seacows which literally had a forest of 'proper' trees growing around them. They must of been there for years. How does this happen? Then to lift the track is mad! There was locos scattered down the banks on the Park line after one train ran into the back of another. They were there for years too.